WASHINGTON (CNN) - President Donald Trump touted his administration's anti-abortion record on Friday during remarks that made him the first sitting president to speak via video feed to the March for Life gathering in Washington. "Under my administration, we will always defend the very first right in the Declaration of Independence and that is the right to life," Trump said from the Rose Garden, flanked by March for Life participants. Trump's video address heralding his administration for a series of anti-abortion decisions that have been made over the last year reached thousands of anti-abortion activists gathered on the National Mall. Trump said his administration would continue to push for an anti-abortion agenda in the rest of his time in office. "That is why we march, that is why we pray, that is why we declare that America's future will be filled with goodness, peace, joy, dignity and life for every child of God," he said. Trump also decried the controversial, but rare, later term abortion procedure, calling them "wrong" and a practice that "has to change." Ahead of Trump's remarks, Trump's Department of Health and Human Services announced that the administration was rescinding an Obama-era Medicaid guideline that limited the way states could take action against medical providers that provide abortion services. Dr. Charmaine Yoest, the department's assistant secretary for public affairs, told reporters that the Trump administration believes "it is essential to protect and defend the prohibition of Medicaid coverage from most abortion procedures." "This is part of the Trump administration's commitment to rolling back regulations that Obama administration put out to radically favor abortion," Yoest said. Trump also touted his health department's new policies and said his administration is protecting "the sanctity of life and the family as the foundation of our society." Trump, ahead of his speech, also proclaimed January 19 as National Sanctity of Life Day. "Today's actions represent promises kept by President Trump and a rollback of policies that had prevented many Americans from practicing their profession and following their conscience at the same time," acting Health and Human Services Secretary Eric D. Hargan said. Vice President Mike Pence, who is slated to leave Washington for a trip through the Middle East on Friday, introduced Trump at the event, touting the President's first year in office and his decisions about abortion policies. Pence said the anti-abortion movement was strengthened "one year ago tomorrow (when we) inaugurated the most pro-life president in American history." Pence, though, has a significantly longer record of anti-abortion activism than Trump. Where the former governor of Indiana has long labeled himself an anti-abortion activist, Trump used to identify as a support of abortion rights. "I'm very pro-choice," Trump told NBC in 1999. "I hate the concept of abortion, I hate it, I hate everything it stands for. I cringe when I listen to people debating the subject. But I still just believe in choice." When pressed on whether he would ban partial-birth abortion, Trump added: "No. No. I am pro-choice in every respect." Trump later said during the campaign that he "evolved" on the issue of abortion, telling Fox News in 2015 that he had a friend who was going to abort their pregnancy and didn't and that led him to change his views. As president, Trump has governed as an anti-abortion commander in chief. He reinstated the Mexico City policy, which bars nongovernmental organizations from receiving money from the United States if they promote abortion as family planning. Every Republican president since Ronald Reagan, who introduced the plan, has supported the policy. And in a move that was heralded by anti-abortion activists, Trump appointed Neil Gorsuch, an anti-abortion jurist, to the Supreme Court and has filled lower courts with anti-abortion judges. 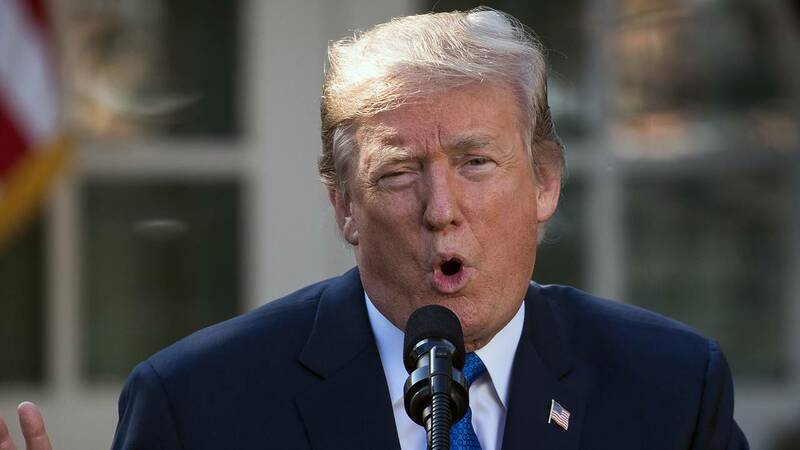 "If all Trump did was work to fulfill his four major promises, he would already be the most pro-life president we have ever seen -- but he shows no sign of stopping there," Marjorie Dannesfelser, the president of the anti-abortion Susan B. Anthony List, wrote on Friday.